W.A. 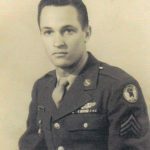 “Buck” Bridewell Jr., 93, of Glen Rose, passed away January 25, 2019 in Glen Rose. Services will be held at 11 a.m. Monday, January 28 at First Baptist Church in Glen Rose. Visitation: Sunday, January 27 from 3 to 5 p.m. at Wiley Funeral Home in Glen Rose. Interment: White Church Cemetery in Glen Rose. Buck was born October 15, 1925 in Dallas Texas to Walter and Gladys Bridewell. He served 24 missions as a nose gunner on the B24 Liberator Bomber during WWII in Italy. In 1955 he settled in Somervell County where he was a longtime rancher and also a former president of the Somervell County Youth Fair Association. He was a member of the First Baptist Church in Glen Rose where he served as a deacon, Sunday school teacher and also a member of the church choir for many years. He is survived by his children: Gloria Rutherford and husband Don, Wayne Bridewell and wife Debbie; grandchildren: Kevin Rutherford and wife Becky, Holly Bailey and husband Brad; great grandchildren Aryn Bailey, Clay Bailey, Victoria Rutherford. Buck was preceded in death by his parents; wife: Helen Jackson Bridewell; brother: Robert Earl Bridewell; sister: Mary Jane Jefferson. In lieu of flowers, donations may be made to Community Hospice of Texas, Johnson County Meals on Wheels or First Baptist Church Glen Rose Building Fund. Our prayers are with all the family during this time of grief. Buck Bridewell--so many memories of him and Helen that start with moving in to our GR duplex in 1991! He and Helen, along with several other FBC members, helped us unload, and for the next 14 years, Buck commented about how many clothes I had! He also ALWAYS gave me grief about being left-handed--I had mentioned that to George/Buddy just this last week. My most favorite memory, however, was organizing the GRHS Graduation when Buck was honored as a WWII vet who left for war without graduating and was given his HS diploma. He was so honored and humble. Buck was a stabllizing figure at FBC during some trying times. Loved that man so much. Bridewell family: Thank you for sharing Buck and Helen with so many of us. They were special, special Christian friends. Gloria and Wayne, you are in my prayers. Your dad, Buck was such a special person and is loved by so many. We will miss him dearly. Buck was a special man that will be missed. He was a servant for the Lord and to his country. Buck was such a precious saint and was loved and admired by all who knew him. When our boys were little they would always ask if Buck was going to be at church (of course he always was) because they loved his teasing. Prayers for you and your families, Gloria and Wayne. Buck was such a precious saint — one of my favorite people growing up in Glen Rose. He would always tease our boys when they were little and would see him at church. They loved Buck as did everyone who knew him. Gloria and Wayne, we will keep you in our prayers. Even though Buck is rejoicing right now, it’s still hard for you.